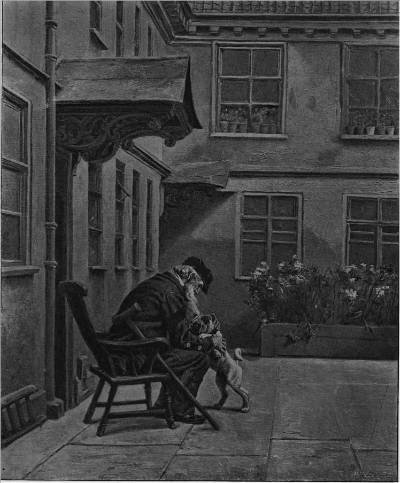 Crowe visited Bristol on an Inspecting trip on behalf of the Department of Science and Art, and sketched the old sailor at the Duke Street almshouse on 29 November 1894. The painting was purchased from Eyre Crowe by Bristol Art Gallery in 1905, as part of the Capper Pass Bequest, but was sold on into private hands in 1956 and its present whereabouts are unknown. In The Mourners (747) an old fellow seated in front fondles a demonstrative dog, and, with his crutch leaning against his chair, makes a capital accessory, and suits the character of the scene. There is excellent painting in the walls and pavement.